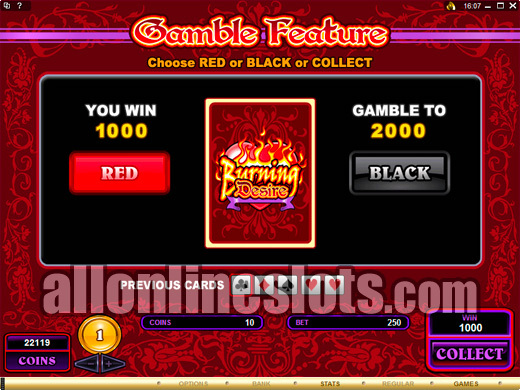 Burning Desire is a 243 Ways video slot from Microgaming. The 243 Ways format means all wins pay as left to right scatters. Max bet is 250 coins per spin and the top jackpot is 3,000 coins. The free spins bonus offers 15 spins with wins tripled. 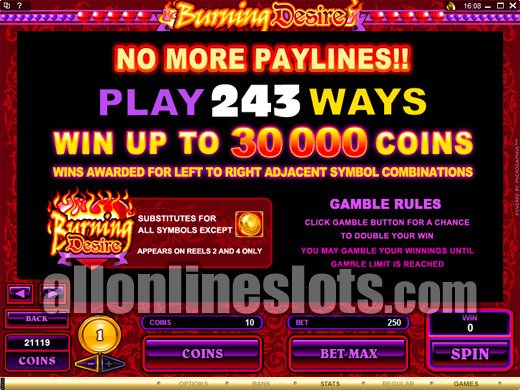 Burning Desire is the first Microgaming online slots to use the 243 Ways game configuration. The idea of 243 Ways is not new as it first appeared on Aristocrat's Indian Dreaming way back in 1999. 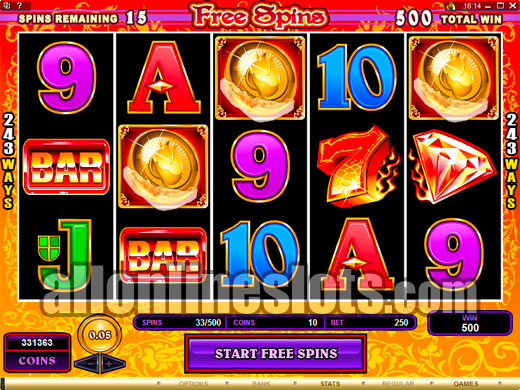 It is also used on several IGT slots such as Triple Fortune Dragon. If you have never played a 243 Ways slot then it is quite an interesting idea as the game has no specific lines. In essence all of the symbols are scatters aligned left to right. Get five of the same symbol anywhere on the screen and you win the five of a kind pay. You don't have to bet a coin per line, rather you simply make a bet of at least 25 coins to have all 243 lines active. You have the option of betting up to 10 coins per spin for a maximum bet of 250 coins. Each additional coin you bet multiplies your wins by one. So at max all wins are multiplied by 10. Burning Desire has a good range of coin sizes which range from 1c to $1. With a 250 coin max you are looking at betting $2.50 and $250 if you are going to hit the max bet button. YOu can also get away with just playing one coin if you have a smaller budget - you will not miss out on any of the games features. The game has a wild symbol but it only appears on the second and fourth reel. The Burning Desire logo is wild and acts like a joker for all symbols but the scattered coin. Seeing as you cannot get five wilds the symbol to look out for is the diamond. Getting five diamonds pays a nice 3000 coins or 30,000 at max. Other good pays include 2000 coins for five 7's, 1500 coins for five bells, 750 coins for five bars and 500 coins for five roses. The A, K, Q, J, 10 and 9 symbols make up all of the lower pays which for five of a kind range from 200 to 100 coins. All of the wins above can be multiplied by up to 10 depending on how many coins you play per spin. The scattered coin symbols are the symbols to watch for if you want to get the free spins. Get three, four or five scattered coins anywhere on the reels and you win 15 free spins. During the free spins all wins are tripled so the top jackpot at max bet grows to a very nice 90,000 coins. 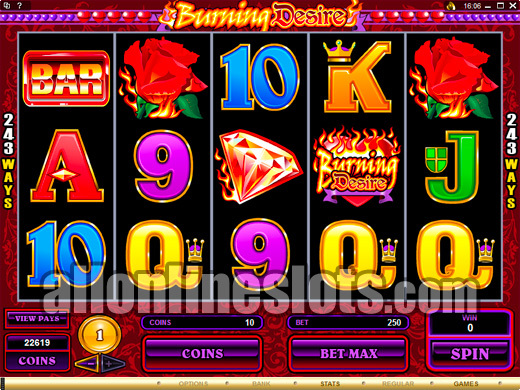 Burning Desire is sure to become a very popular game if the success of Aristocrats Indian Dreaming is anything to go by. If you have never played a 243 ways slot machine then it is definitely worth checking out.